Relish Clothing had a sale on Closet Clean-out bags for Labor Day. You received 4 pieces of clothing for $60 (I think, the sale sold out and is not available anymore). It was only a weekend sale, but then it was extended a couple days. And one day I received an e-mail that the Closet Clean-out bags were marked down to $20 for 4 pieces. Well, of course I jumped at the chance and bought two bags. At that price I figured even if I only liked 2 pieces out of 8 it would be worth it. And I could try to trade everything I didn't like or give to friends. 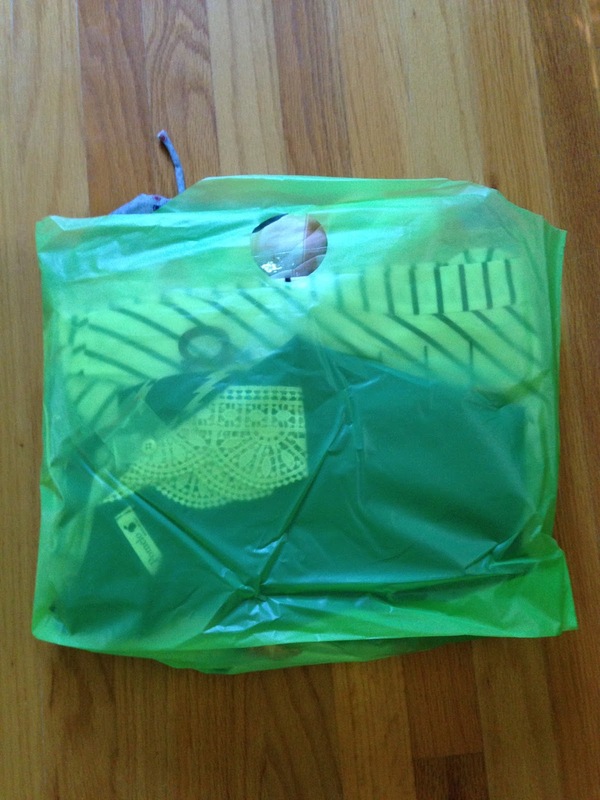 The box arrived last week and everything was packaged in a green bag. I couldn't wait to see what was inside. Here is everything I received. Eight pieces of clothing for $40 + shipping. Can you believe that deal?!? 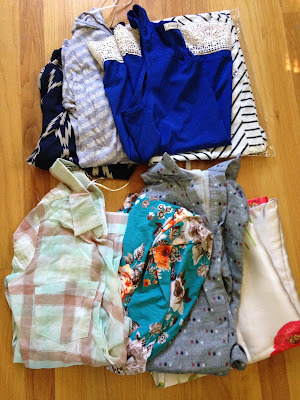 If Relish Clothing ever offers this deal again, even at $60 per bag, it is totally worth it! I loved the color immediately! I didn't take styled pictures, sorry about that. But I figured since this was no longer available, I'd still post pictures of the clothing, so you can get an idea of what type of items you may receive. 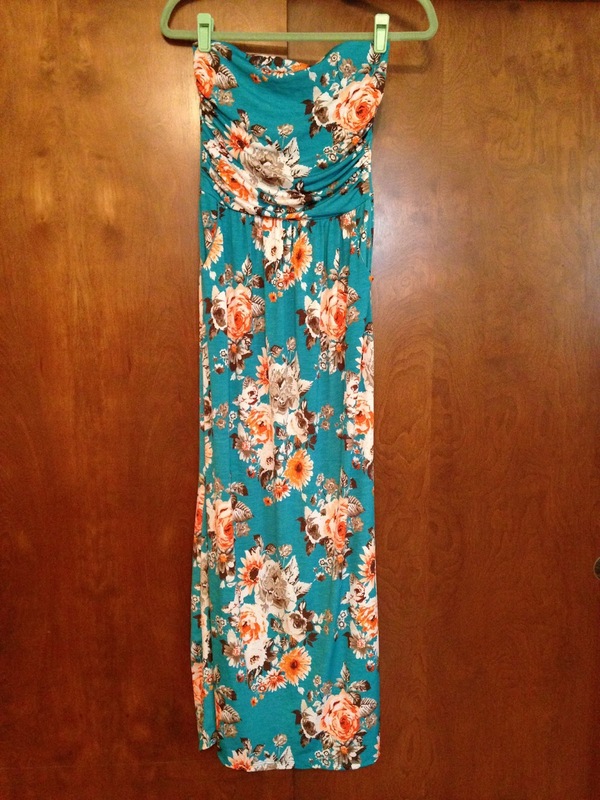 The first item was a Vanilla Bay Floral Maxi Dress. 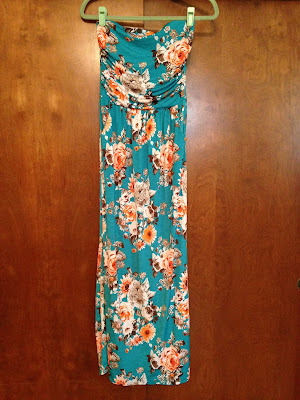 I loved the color of this dress and it will transition nicely to Fall, with the browns and oranges. It will look great with a denim jacket and ankle boots. This dress is very comfy and has pockets. I love that! 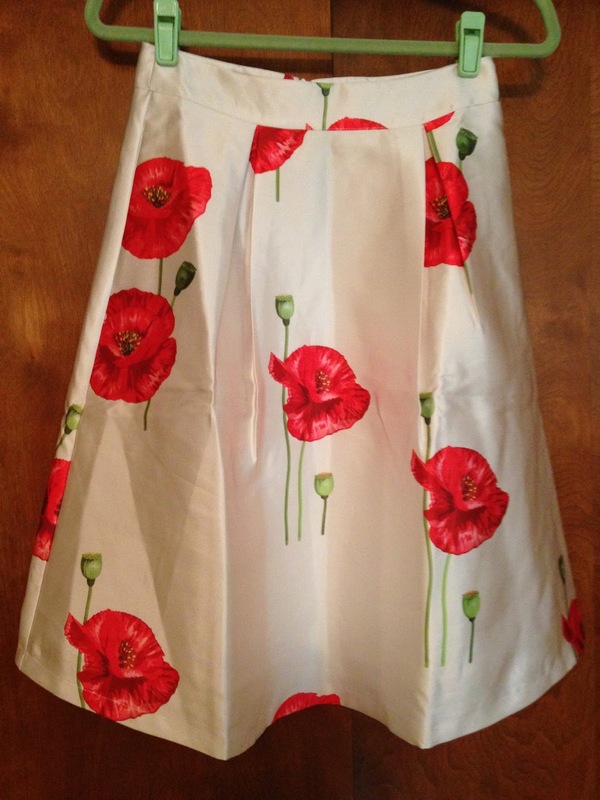 The next item was a Banana Poppy Skirt. This is a fancy skirt, because of the satin material. I'll need to find an excuse to wear this. It fits perfect and I love the full shape! 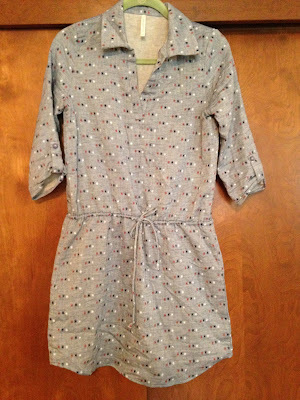 I also received a Peppermint Chambray Drawstring Dress. 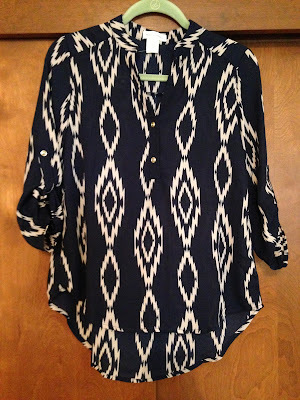 This is cute and I think it will transition nicely to Fall with a cardigan and boots. This is a thick and comfy material. The only thing I'm unsure of is the collar, but I think if I style it right, I can make that work. It also fits a bit large, but I think it's supposed to and I'll wear it as is. 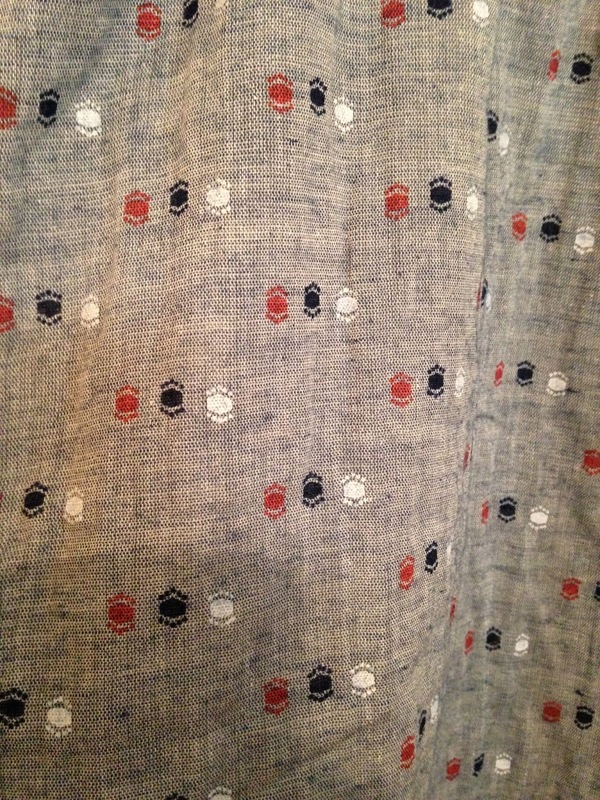 Here is a close up of the fabric and print. The next item was an Ellison Plaid Open Cardigan. I was happy I received this. I had seen it in other reveals and was hoping I'd get it too. The sleeves can be worn long or rolled up. It's very light and I love the mint color I received. I have to work on styling this one, because it's not something I would normally wear, but I really like it. 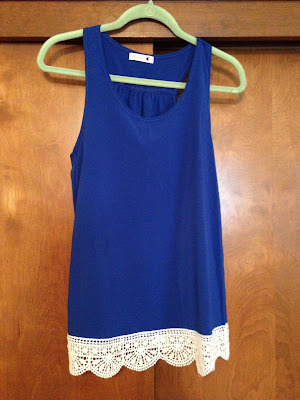 My favorite color to wear is cobalt blue, so I was so happy to get a Pomelo Cobalt Blue Tank with Crochet Detail. This is so cute! 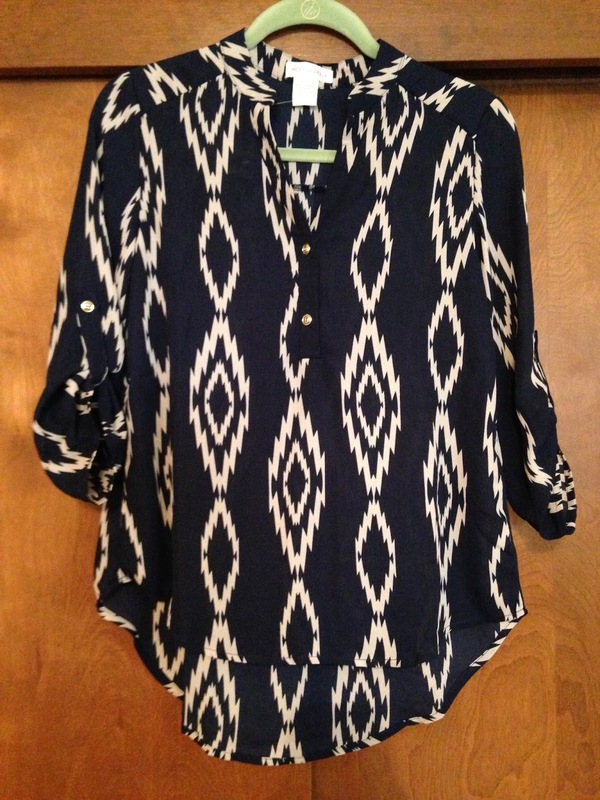 It fits a bit large, but will be great with a blazer or cardigan for work. This is something I would have purchased in the store and would have paid at least $20 for. I already knew at this point I had received a great value from these Closet Clean-out bags. 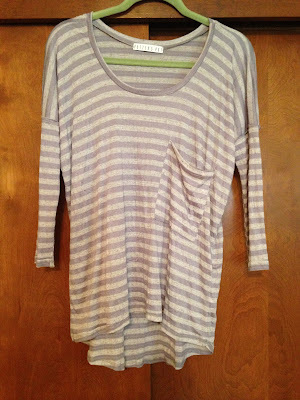 The next item was a Potter's Pot Striped Slouchy Tee with Pocket. This item I didn't think I'd like right out of the bag. When I tried it on, it was comfy and slouchy and I think this will work great with leggings for Fall. I know this will be one of my go to shirts. I love receiving items I would never pick up in a store that just end up working so well. 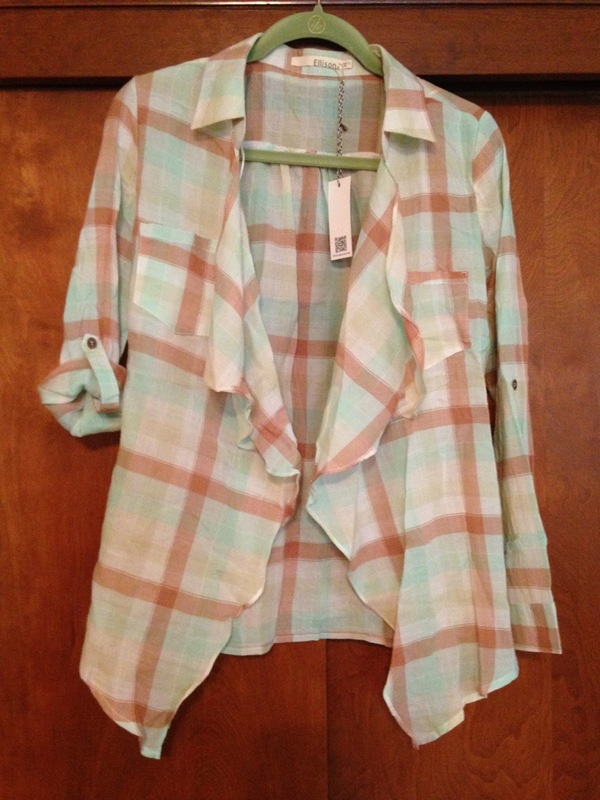 This Miley and Molly Navy/Tan Blouse is amazing! I would have purchased this in a second if I found it in a store. Navy is my neutral color that I wear most! This is exactly the type of shirts I wear to work. I love how it can be dressed up or worn casually on weekends. I was so excited I received this! 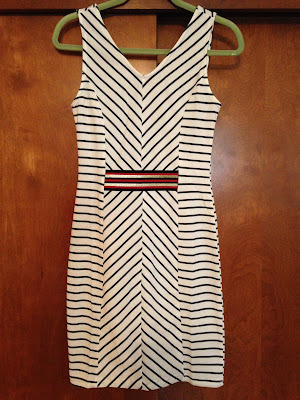 The final item I received was LeShop Striped Dress. I normally do not like anything bodycon. I prefer styles with fabrics that are loose and flowy, or a fit and flare, or shift styles. I was ready to put this up for trade, but then I tried it on. And this dress is definitely staying with me and will be a welcome addition to my wardrobe. 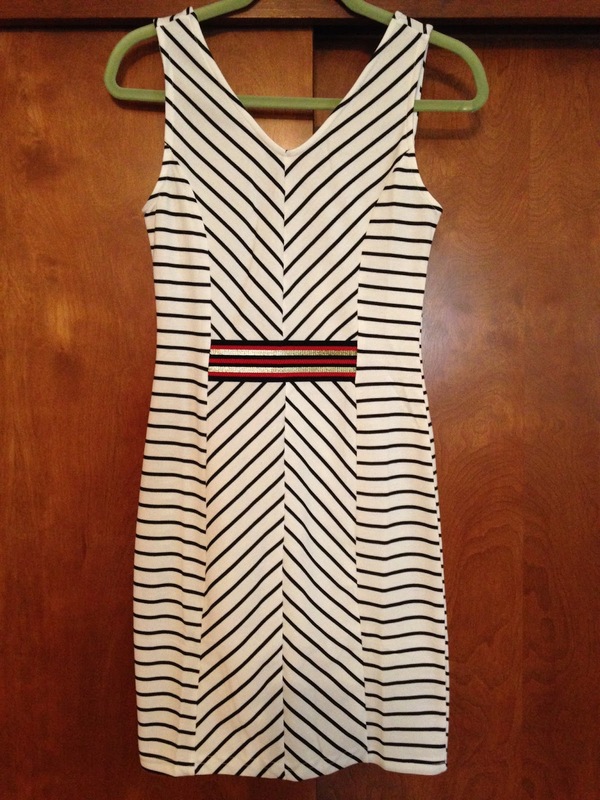 The stripes made it so flattering! This looked great and would make the best date night dress!!! I absolutely loved everything I received and didn't have to trade anything. After trying everything on, I loved it all and know I will wear everything. It really made me think that I've been going about these surprise clothing boxes all wrong. I always try to put tons of comments to ensure I get items I like and for the most part, I'm not happy with what I'm sent. This was an un-curated bag, everything was picked for me without any idea of my likes/dislikes and it was the most successful surprise clothing package yet. So, from now on, I think I should not say anything about what I like and don't like and just see what is chosen for me. I won't be shopping for awhile, because my closet is over flowing right now, but Relish Clothing really delivers when the need for new clothes arises.